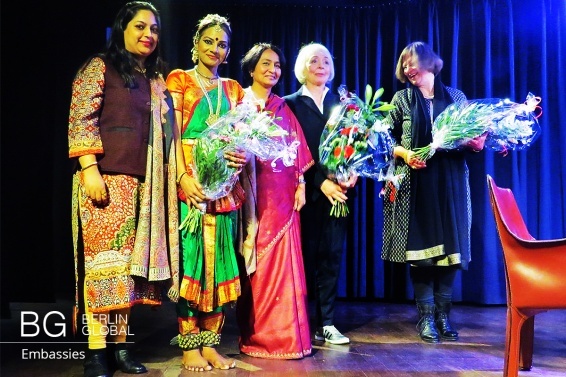 The Cultural Wing (The Tagore Centre) Berlin organized a special programme, entitled ‘Celebrating Women’ to mark International Women’s Day on the 8th March, 2016 in the Embassy of India in Berlin. The event was attended by a lot of people, mostly women, but also a few men. The event was opened by the Ambassador, His Excellency Mr. Gurjit Singh and his spouse, Mrs. Neeru Singh. 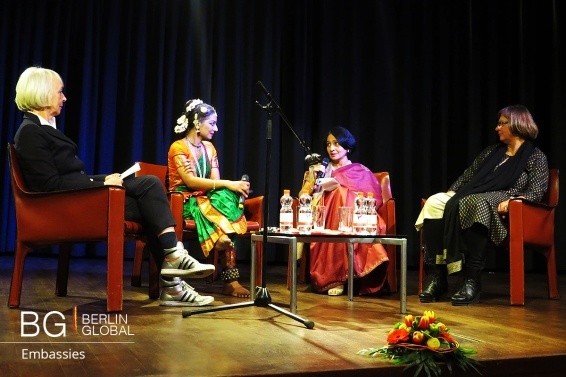 The event was focused on three special guests: Ms. Anuya Rane (artist), Ms. Karin Kaiser (writer) & Ms. Nele Münchmeyer (filmmaker) and the interesting discourse on the role and status of women in our society as a whole. Ms. Anuya Rane is a dancer and educator who specializes in Bharata Natyam which is a classical Indian dance, she was born in Mumbai, India. Rane studied at Nalanda Nrityakala Mahavidyalaya, a college for dance education affiliated to the Mumbai University. She earned a bachelors and masters degree, specializing in Bharata Natyam. She has been teaching dance since her University days, where having completed formal education, she embarked on her quest as an artist through her performances in India and in Europe, demonstrating her art form, and paying tribute to ‘Shakti’ – the female divine force. Karin Kaiser, the second women celebrated at the event grew up in the Black Forest in Germany, and has been teaching art and pedagogy for many years in schools in Berlin. Cooperation on a sound project led her to India - and ever since she can not get rid of her love and fascination for the exciting country and its people. On numerous trips and cooperation with various humanitarian projects Karin Kaiser got to know India from many different sides. From her years of experience, it is clear that she loves both the negative and the positive aspects of the most diverse societies in the world. Ms. Karin Kaiser read excerpts from her book ‘Bangalore Masala’, in which the protagonist is Anjali, a young and independent female journalist from India who fights against all odds to protect her interests and loved one. The third woman to perform at the event was Ms. Nele Münchmeyer who spoke about her films ‘Drums and Trumpets through India’ and ‘Bollywood : The Sound of Indian Cinema’. Nele Münchmeyer was born in Augsburg and she currently lives in Berlin. She is a freelance writer and film director, of documentaries and film productions. After graduating she gained experience as an assistant director and editorial assistant for many german radio and TV channels. She is famous for her live recordings and telecasts of opera, theater and concerts, she also makes documentaries about music and culture, as well as ones about foreign countries and their culture. The second part of the event involved all three women coming together on one common platform to talk about their individual journeys as a woman with a dream. They were joined also by the wife of the Ambassador, Mrs. Neeru Singh.